The Elected Mayor of Watford, Peter Taylor, was joined by Boys & Girls Nursery Area Manager Kelly Ridge and Nursery Manager Bryony Tuffey today as they officially opened a brand new play area for children at Boys & Girls Nursery, based in Loates Lane, Watford. 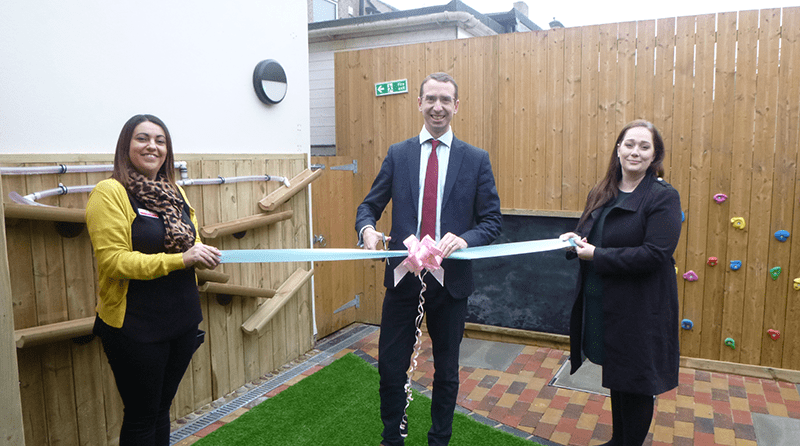 The cutting of the ribbon signalled the official opening of the recently refurbished play area, which includes water chutes and funnels for the children to experiment with, a chalk board for mark making, a climbing wall for the children to master and much more! The completed project has been met with excitement by both the children and parents alike.